The boating community covers a really wide spectrum. We are at home on the sea, lake or river, where we race and cruise all kinds of craft - sailing, rowing or powering. Every one of these activities has a great many followers and I think this diversity is great. My own area of interest is: kayaks, sailing dinghies and yachts. A few years ago I have added planing powerboats to this list. Although I have taken part in club racing and thoroughly enjoyed it, my choice of sailing and boating is more cruising oriented. My leaning towards cruising and exploring goes way back to my kayaking time. I used to enjoy paddling in the backwaters of the Danube river, exploring the wonderful natural habitat and often chancing on unsuspecting deer or otters. This spirit of exploration culminated in a circumnavigation on "Tamara", the gaff-rigged cruiser I designed and built for that purpose. All this past experience influences my approach to design, construction and fitting-out of small craft. Designing for simplicity, which is more difficult than designing something complex. Using appropriate technology - today that has to include the epoxy stitch and glue method for small craft. Innovation in employing technology coupled with tested and proven methods of construction. Ensuring that key components like rudders, keels, anchoring systems will not fail you. My bias for boats that will go cruising is steel construction, closely followed by aluminium. Plywood construction produces light and strong boats and although mostly employed for one-off building is suitable for moderate production runs. Polyester/epoxy glass construction tends to be more suited to series construction than one off, but there are two methods that I have used that are suitable for one off's. I have had an on-going romance with the simplicity of gaff, as evidenced in my own yacht. For sailing dinghies I find the "Gunter" gaff rig very useful in keeping spars short. This rig really comes into its own if the gaff runs parallel to the mast, which leads to sailing qualities comparable to Bermudan rigged boats. On a yacht's tender or small sailing dinghy, I feel that either a sprit sail or a lug sail will be a good utility rig and will stow inside the dink and provide simple and enjoyable propulsion while also being lots of fun for the kids. 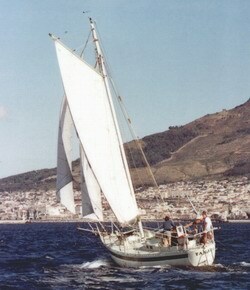 Having said that, a Bermudan rig will be first choice for many and all my designs can be had rigged like that. From the smallest sailing dink to a cruiser that will take you around the world - I can tailor a boat to suit your requirements and pocket!